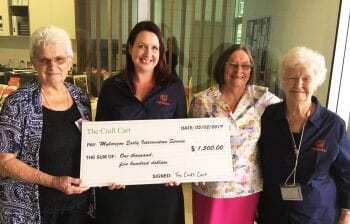 The team at Myhorizon’s Early Intervention Centre were thrilled to receive a $1500 donation this week, generously gifted from Rita’s Craft Cart proceeds. Katie Marsden (second from left) of Myhorizon’s Early Intervention Service being presented with a cheque from Bea Waugh (far left), Lyn Vinson (second from right) and Rita Morris (far right). Recent Redlands Senior Citizen of the Year winner, Rita Morris, runs her craft cart out of Myhorizon Centre in Capalaba, and relies heavily on the craft items donated by locals, to raise funds for children with disability. “I am very grateful for the beautiful handmade craft items I regularly receive, which are very popular with my customers. Fundraising is a community effort which I couldn’t do without the generous craft donations” Says Rita. Rita receives a variety of quality handmade items from supporters like Lyn Vinson who has been an avid contributor to Rita’s mission for many years now, even back when Rita was selling crafts from her corner stall on Cleveland’s Bloomfield St.
Bea Waugh from Birkdale, and her daughter Vicki who was born deaf and partially blind, also create and donate a variety of painted pots and tiled homewares, all available for sale through Rita’s Cart. Myhorizon’s Early Intervention Practice Manager, Katie Marsden is grateful for the ongoing support from the Craft Cart and its regular supporters. “The funds we’ve received from Rita’s Cart will enable us to provide extra therapies and supports to children with disability in the Redlands community, which many families cannot always afford.” Says Katie. 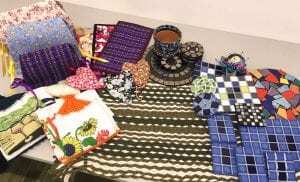 To donate your craft items, or make a purchase from Rita’s Craft Cart, visit Myhorizon Centre, Runnymede Rd, Capalaba, open 8.30am till 2pm Monday to Friday. Click here to find our more on Myhorizon’s Early Intervention services, or send us an enquiry using our Contact Form.